I'm a big fan of painting my nails and love all different colors. Color Club is a company that sells all different fun colors of nail polish. They also sell lipgloss and lipstick. I was sent the Wicked Sweet collection and the Alter Ego collection for my review. From the Wicked Sweet collection, I decided to paint my nails in the blue color seen above. It looks very nice on and is scented too. It smells like blueberries! I used two coats of paint just because I'm going to be swimming a lot this weekend and wanted to make sure that it will stay on. So far, so good! The Alter Ego collection will be perfect for fall with all of the dark colors. In fact, I already painted my finger nails with one of the dark purple ones. It also comes with a clear top coat which is nice to make your nails shiny and keeps on the polish longer. A set of nailpolishes costs $48 and comes with seven polishes. They have all different kits of colors that go together which is really neat! These polishes seem to be nice quality and I love that they have tons of different fun colors to choose from. 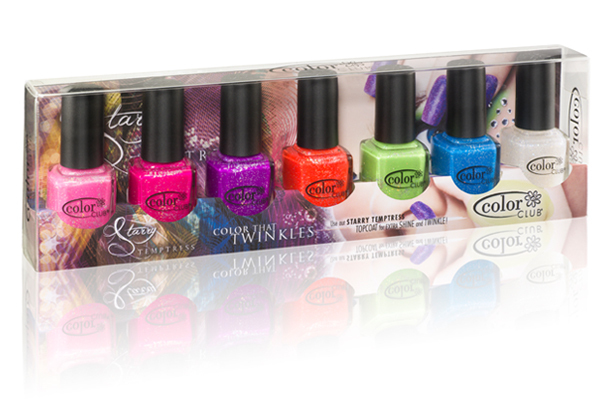 The giveaway will be for a set of Color Club nailpolishes ($48 value!) to one lucky reader of The Nutritionist Reviews. The giveaway is open until Midnight on Tuesday August 9th. Winner will be chosen on Wednesday August 10th using Random.org. The winner will have 48 hours to respond or a new winner will be chosen. Visit the Color Club website and let me know what color you are the most interested in! -Like Color Club on Facebook (2 entries). -Write on the Color Club Facebook page that The Nutritionist Reviews sent you (1 entry). I like He Loves Me, although the Twiggie is a fun color too! I like Uptown Girl . The color I like is Catwalk. Would really like to try Jewel of a Girl! I like the Almost Famous color. I like the Warhol color best. All of the colors have really cool names. I'm most interested in the Sugar Sheer color! i really want the "almost famous" color! I like "Jewel of a girl" for fall ! that you sent me ! I joined the Colour Shop facebook page and posted a comment. I am in love with Sugar Sheer, yum, eh? I am on your facebood and receive your emails! I love the Almost Famous, it's really bright and would look awesome with a tan. I like the Wham! Pow! color the best. I like Color Club on facebook as Alison Faith Tolar. I like the Peace Out Purple. Thank you! From the Color Club, I really like the 'He Loves Me' colour. I am a fan of The Color Club on Facebook. I commented on The Color Club's Facebook Wall (it would not let me copy and paste). Pardon My French is my favorite-such a soft pretty color. I like how bright Mrs Robinson is! Definitely my favorite color. I like She's Sooo Glam. I like He Loves Me. I like the Ready to Royal color! I like you on Facebook under Kayla @ TheEclecticElement! I really like Nothing But Truffle...it's different! pink is my favorite color so I like "all that razz" most. I'm most interested in Hot Couture color. Almost famous is such a pretty color.